The State of Maryland and the Maryland Department of Veterans Affairs (MDVA) are honored to offer our veterans and their eligible dependents a final resting place at one of five state veterans cemeteries located throughout Maryland. The MDVA Cemetery Program is the largest of its kind in the nation. In addition the Maryland Department of Veterans Affairs manages three veteran Memorials. The Maryland World War II Memorial is in Annapolis, and the Vietnam War and Korean War Memorials are in Baltimore. Additionally, the Department shares joint responsibility with the City of Baltimore for the War Memorial Building in Baltimore. See red flags for cemetery locations and green flags for monument locations. The MDVA follows criteria established by the U.S. Department of Veterans Affairs National Cemetery Administration (NCA) to determine eligibility for burial at a Maryland Veterans Cemetery. Eligibility criteria for both veterans and dependents can be found by visiting the National Cemetery Administration. In addition to the NCA requirements for veterans eligibility, the MDVA also has a residency requirement of the veteran. See below for documentation requirements. military service: A copy of an official military discharge document is usually sufficient to determine eligibility for burial. Discharge documentation is usually not needed for scheduling when a veteran or eligible dependent is already interred in a Maryland Veterans Cemetery. Interment services are conducted daily Monday through Friday every forty-five minutes between the hours of 10:00 am and 2:30 pm. For visitors to our cemeteries the gates open every day of the year at 8:00 a.m. The gates close at 4:45 p.m. to allow visitors to exit the cemetery. The cemetery remains open until 8:00 p.m. on Memorial Day (the date of State observance). A Pre-interment Program is available for veterans to indicate their desire to be buried in one of the state’s cemeteries. On a pre-need basis this Program provides initial eligibility for burial. Please note that a pre-approved interment letter does not finalize eligibility for burial in a Maryland Veterans Cemetery. The MDVA reserves the right to confirm final eligibility for burial at the time of death. To apply complete the Pre Interment Application and mail to the MDVA Cemetery Program. To schedule a burial in all Maryland Department of Veterans Affairs cemeteries, the veteran’s family or survivors should furnish to the funeral director a copy of the veteran’s military discharge documents and proof of his or her Maryland residency. The funeral director will contact the cemetery to receive a burial eligibility determination and to schedule a date and time for the burial services. The funeral director or other person making interment arrangements for an eligible person should communicate immediately with the Superintendent of the nearest State Veterans Cemetery. They should furnish all pertinent data, including military service information, the claim number of any U.S. Department of Veterans Affairs claim, Social Security number and other information establishing legal residence within the State. In each Maryland State Veterans Cemetery, a Chapel is provided for committal services for reasons of public safety. All services in State Veterans Cemeteries are brief committal services, no longer than 20 minutes. If desired, the family may accompany the remains of their loved one to the assigned burial site and view the interment from the roadside where their safety can be assured. One grave site will be assigned for the burial of an eligible veteran and the eligible members of his or her immediate family. If a family member is to be buried, interment will be either above or below the veteran. Assignment of a grave site will be made on the basis of availability at the cemetery closest to the veteran’s home at the time the request for interment is received and after the eligibility of the veteran or family member is established. A particular grave site may not be reserved in advance. All grave sites are assigned on the scheduled date of burial. However, at the time of a veteran’s death, if it is established that the surviving spouse is an eligible veteran entitled to a separate grave site, the Department may approve a request to adjoin the grave sites of husband and wife. The Garrison Forest Veterans Cemetery no longer has independently apportioned burial sites for Jewish Veterans. 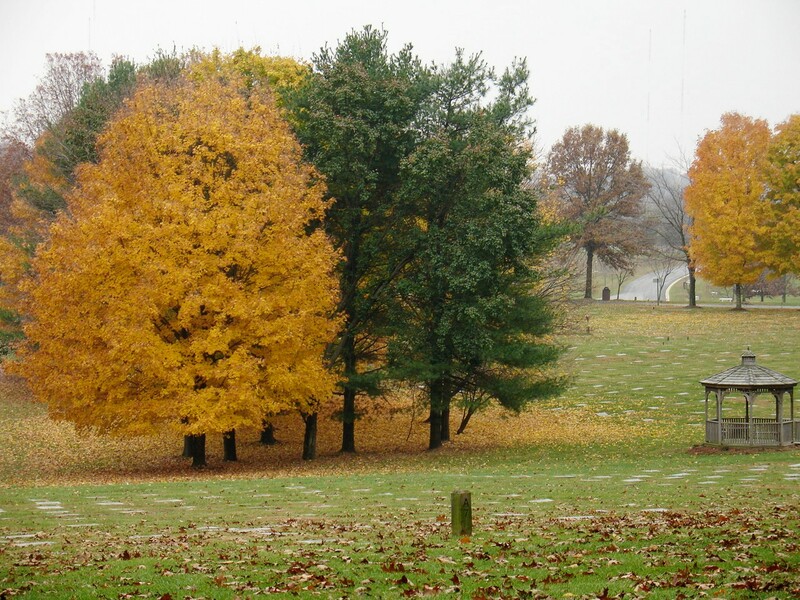 If it is the wish of a Jewish Veteran or family member to be interred in an apportioned section, there are limited burial sites available at the Cheltenham and Crownsville Veterans Cemeteries. The practice of establishing reserved sections for certain categories of individuals is prohibited at all Veteran Affairs National Cemeteries and grant funded State Veteran Cemeteries. The US Department of Veterans Affairs no longer allows apportioning sections of a cemetery to Jewish Veterans. In order for the Maryland Department of Veterans Affairs to meet eligibility criteria for a 100% funded grant from the US Department of Veterans Affairs, the State of Maryland must certify compliance with Section 39.11 of Title 38, Code of Federal Regulations including all Federal Statutes relating to non-discrimination. Please forward questions relating to this information to Chris Piscitelli, Cemetery Program Director, 410-923-6981. An interment receptacle is either a burial vault or liner constructed of concrete and is intended to protect the casket from water and other elements. Maryland law requires the use of an interment receptacle for the interment of all casket remains in a Maryland State Veterans Cemetery. A burial liner will be provided by the State for the casket remains of each eligible veteran interred. The liner is provided at no cost to the veteran’s next-of-kin. A veteran’s eligible dependent may either purchase a liner from the Veterans Cemetery at the actual cost incurred by the Department or may purchase an alternate interment receptacle through the funeral home. If a grave liner that exceeds the standard dimension is required for the burial of an eligible family member, it is the responsibility of the deceased’s next-of-kin or their agent to purchase, deliver, and install the grave liner. If a burial vault is desired, arrangements for its delivery and installation must be made independently by the veteran or his/her survivors or his/her legal representative. The cost of the vault and its installation is the responsibility of the veteran or his/her survivors or his/her legal representative. The remains of a veteran or a member of their immediate family shall arrive at the cemetery and be interred in a casket that is acceptable for viewing in a funeral home establishment. The interment of shipping containers, wooden boxes, and other similar containers is not permitted. Once the casket has entered the State Veterans Cemetery, it may not be opened or stored in a cemetery building pending final determination of eligibility. All viewings of the veteran’s or family member’s remains are to be conducted at a funeral home or other establishment outside the State Veterans Cemetery. A permanent grave marker with an appropriate inscription will be furnished for each veteran or eligible dependent by the U.S. Department of Veterans Affairs. Each grave site in a State Veterans Cemetery is marked with a single granite marker which contains, when appropriate, the inscription of information about the veteran and other eligible family members interred. The standard grave marker in a State Veterans Cemetery is the flat granite type. Placement of any type other than the standard flat granite marker is prohibited. The Superintendent of the Veterans Cemetery will file an application for a marker on the day of the eligible veteran’s or family member’s interment. The grave marker shall be installed and maintained by the cemetery at no expense to the veteran or the veteran’s estate. Headstones are generally received from the U.S. Department of Veterans Affairs within 6 months after the date of burial. Please be aware that the Maryland Department of Veterans Affairs has no jurisdiction over the timeliness of headstone delivery. The Maryland Department of Veterans Affairs is not responsible for damage to, or destruction of, a grave marker by individuals other than employees assigned to that cemetery by the Department. In accordance with U.S. Department of Veterans Affairs policy, government-provided headstones and markers remain the property of the United States and no one is authorized to alter them in any manner. Flower vases and other objects are not permitted to be affixed to Government markers. Great care is taken to ensure our veteran cemeteries serve as national shrines. In order to become a national shrine the US VA National Cemetery Administration establishes standards by which state veteran cemeteries must comply. Markers are continuously assessed to determine the need to raise and realign, safeguarding dignity for our veterans and dependents interred in the cemetery and ensuring compliance with these standards. Over time, environmental conditions, such as freezing, thawing, and extreme weather, may impact alignment and leveling of markers causing misplacement. The grounds are assessed continuously by cemetery personnel. When a misalignment is observed, or when notification of a misalignment is received, prompt attention is given to reset markers. If you have questions regarding our efforts to serve as a national shrine, please contact the Cemetery Superintendent in the Administration Office. On weekends you may leave a message at the corresponding cemetery and your call will be returned the next business day. An eligible veteran receives a burial plot, a grave liner, headstone and interment services at no expense. Other expenses incurred in the preparation or transportation of the remains, including funeral costs, is borne by the veteran’s next-of-kin, legal representative or estate. For disinterments or re-interments of casketed or cremated remains, an opening/closing cost of $780 will be charged for veterans, dependent spouse(s) or children. The burial of an eligible dependent will be equal to the burial plot allowance provided by the U.S. Department of Veterans Affairs for burial of a veteran in a State Veterans’ Cemetery. The cost is subject to change yearly (October 1) when the burial plot allowance could be adjusted by the U.S. Department of Veterans Affairs. Checks and money orders should be made payable to Maryland Department of Veterans Affairs prior to interment. Fresh cut flowers may be placed on graves at any time in metal containers. Glass containers are not permitted. Flowers and temporary containers will be removed from graves as soon as bouquets become unsightly. During the growing season, when grass requires cutting, both fresh flowers and those that have become unsightly will be removed from graves prior to grounds maintenance. Artificial flowers and wreaths may be placed on graves from November 1 through March 31 only. Wreaths and seasonal displays are permitted only from December 1 through January 31. Any seasonal displays remaining on graves as of February 1st will be removed and discarded. It is recommended that family members and friends retrieve valuable floral arrangements before that date to avoid disappointment. With the exception of Christmas, potted plants and holiday wreaths may be placed on graves 10 days before and 10 days after Easter Sunday and Memorial Day (the date of State observance). Potted plants and wreaths are not permitted on graves at any other time. Permanent plantings, statues, vigil lights, glass objects, commemorative and religious items are not permitted on graves. All unauthorized items will be removed and discarded by cemetery personnel. Floral items and seasonal or other decorations may not be secured or placed on trees, shrubs or other appurtenances within the cemetery. Over 40,000 interments have been conducted in Maryland State Veterans Cemeteries. The Department cannot adequately police all grave sites to deter theft and cannot be responsible for stolen or missing floral items. It is recommended that family members or friends avoid placing expensive, elaborate, floral tributes that may invite theft on grave sites. Small United States flags will be placed on graves by Department personnel at least one day preceding Memorial Day (the date of State observance) and will be removed the day following the holiday, weather permitting. Flags are not permitted on graves at any other time. Effective September 1, 1997, the Maryland Department of Veterans Affairs will no longer accept permanent in-ground flower containers in its five veterans cemeteries. The Maryland National Guard Honor Guard (MDNGHG) offers Military Funeral Honors to veterans who served in the Armed Forces of the United States and were separated with a discharge other than Dishonorable. The MDNGHG operates out of 4 locations throughout the state providing professional and dignified services to departed Maryland veterans. Visit the Maryland Military Department’s Funeral Program for more information. Note: The Maryland Department of Veterans Affairs, including its employees, or representatives, cannot assume responsibility for providing military honors. If military honors are desired, the survivors of the veteran should address their request to the funeral director. The Maryland Department of Veterans Affairs manages three veteran memorials. The Maryland World War II Memorial is in Annapolis, and the Vietnam War and Korean War Memorials are in Baltimore. Additionally, the Department shares joint responsibility with the City of Baltimore for the War Memorial Building in Baltimore. The memorials recognize the contributions of the men and women who fought for the principles of freedom, both abroad and at home. They also serve to educate present and future generations about the sacrifices made by members of the Uniformed Services of the United States. Located just north of Annapolis Maryland on State Route 450 at the Naval Academy bridge, the Maryland World War II Memorial is situated in a beautiful park-like setting at what is commonly known as the Ritchie Overlook. This lasting tribute recognizes the contributions of the men and women who fought for the principles of freedom both abroad and at home, as well as educates present and future generations about World War II and its impact as the world’s greatest military effort to date. Maryland’s World War II Memorial is unique. Visitors walk through history when visiting the four-sided open-air amphitheater surrounded by a 100-foot diameter ring of 48, 9-foot tall, gray granite pillars. These pillars represent the 48 states at the time of the war. The names of 6,628 Maryland residents who lost their lives are etched in granite, providing a lasting tribute to their ultimate contributions. Twenty granite stones accented with stainless steel plaques describe wartime milestones and key events, in addition to contributions made by those 288,000 Maryland men and women who served in the military and those who served at home in the fields and in industry. Two 14-foot diameter granite globes depict the location of key battles in the Eastern and Western Hemispheres. A seven-sided stainless steel obelisk, representing Maryland’s status as the country’s seventh state, is accented by a star which is illuminated each night. The memorial is the culmination of a six-year process which began with the installation of a twenty-five member Commission during the administration of Governor William Donald Schaefer. It was comprised largely of veterans who served their country and their communities, many as professionals from numerous fields and as public servants. This dedicated group, along with advisors from private industry and the State, worked tirelessly to bring Maryland’s World War II Memorial to fruition. A world-wide design competition conducted by a seven-member selection panel culminated in March 1997 with the unanimous selection of a design submitted by New York-based architect Secudino Fernandez. In August 1997, Maryland’s Board of Public Works awarded a $1.7 million contract to Priceless Industries of Dundalk, Maryland to serve as general contractor for the Memorial. October 1997 marked the official groundbreaking for the Memorial. It is with great pride and a sense of achievement that all those associated with the planning, funding, and construction that the Maryland’s World War II Memorial was dedicated. The Memorial was dedicated on July 23, 1998. The Maryland Vietnam Veterans Memorial Commission was formed as a result of unanimous approval of Joint Resolution 22 of the Acts of 1983 which provided that a Commission would be formed to design and erect a Memorial for those Maryland citizens who lost their lives, were missing and for those who served in Vietnam. The Memorial was dedicated May 28, 1989. Considerable effort was made to find a suitable location for the memorial. Eventually, a site in the Middle Branch Park in Baltimore was chosen unanimously by the Commission. The Middle Branch Park provides a contemplative setting overlooking the Patapsco River and has ease of access through local transportation facilities. The Memorial is a ring of stone with a granite wall upon which is inscribed the 1046 names of those who lost their lives in Vietnam. The names of those 35 men who remain missing are also inscribed on the stone. The Memorial features two 45-foot flag poles flying both the flag of the United States and our Maryland State flag with the POW-MIA flag flying under it. Immediately outside the Memorial ring are 16 “spires” which represent the Vietnam years from 1959 to 1975. The three and one-half acre Memorial site is enhanced further by groves of trees and greenery. At the entrance of two walkways leading to the Memorial are flower beds which hold blooming plants to add color. Every effort was made in the planning of the Memorial to ensure that visitors would have a feeling of reverence for those whose service to our nation is honored. The Memorial became a reality due to the efforts of many Marylanders. A group of Vietnam veterans identifying themselves as “The Last Patrol” conducted walks throughout the State. One walk began in Oakland (Garrett County) and concluded – 365 miles later – in Ocean City (Worcester County). A second walk was made from the extreme tip of St. Mary’s County to Annapolis. These walks attracted significant attention and support for the Memorial. Prior to the start of construction, a major effort was launched to identify those whose names were to be placed on the Memorial. Over 700 next of kin were contacted. The list of names to be inscribed grew from 1009 names to the 1046 now listed alphabetically on the Memorial. Construction of the Memorial began in October, 1988. In addition to the financial contributions of corporations, and citizens, the Maryland General Assembly provided funds equaling $2,250,000 for the construction of the Memorial, thus making the Memorial a contribution from all citizens of Maryland as a tribute to all Maryland residents who served in Vietnam. The Korean War Memorial contains the names of the 531 Maryland citizens who died in hostile action during the Korean War along with the names of those Maryland residents still listed as missing in action in that conflict. The centerpiece of the memorial is a 2 ½ foot high ring of granite, measuring approximately 50 feet in diameter. The northern half of the ring is engraved with the names of soldiers who gave their lives during the conflict. The southern half of the ring consists of a series of panels depicting the history of the war. The center of the ring features a 26 foot diameter map of Korea embedded in granite. A walk, which bisects the ring, is anchored by a flag pole at each end: one flying the American flag; the other flying the Maryland state flag. The Memorial was dedicated May 27, 1990. Located in Baltimore City, the War Memorial and Memorial Plaza face City Hall. Maryland residents who died during WWI are inscribed on the wall, with inscriptions of all Maryland Counties and Baltimore City. Dedicated in 1925, the Memorial now serves as a memorial to all Maryland Veterans, the War Memorial Building was designed by Baltimore Architect, Lawrence Hall Fowler. The building is open and available for meetings of veteran groups and patriotic societies, and for civic gatherings. Maintenance costs are shared equally by the State and City of Baltimore. Visit the War Memorial Building website. Located just north of the World War II Memorial in Annapolis, the Gold Star Families Memorial Monument was created by Medal of Honor Recipient Hershel “Woody” Williams to remember those families who have made the ultimate sacrifice. 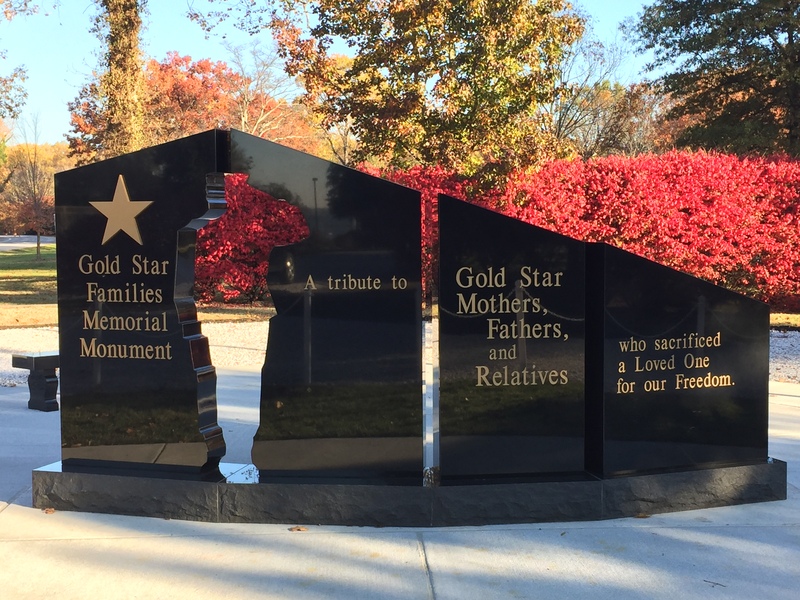 The purpose of the Gold Star Families Memorial Monument is to honor Gold Star Families, preserve the memory of the fallen, and stand as a stark reminder that Freedom is not free. This stunning black granite monument features two sides. One side bears the words: Gold Star Families Memorial Monument, a tribute to Gold Star Mothers, Fathers, and Relatives who have sacrificed a Loved One for our Freedom. The other side tells a story through the four granite panels: Homeland, Family, Patriot, and Sacrifice. The scenes on each panel are a reflection of each community’s Gold Star Families and their fallen Heroes. At the center of this tribute is the most distinct feature of the monument, the cut out which represents the Loved One who paid the ultimate sacrifice in the name of Freedom. To learn more about the memorial, please visit the Gold Star Families Memorial Monument webpage.